Friends of Fort Erie's Creeks (FOFEC) are a non-profit organization located within the Town of Fort Erie. FOFEC is an organization founded and sustained by volunteers who are genuinely concerned for the preservation, restoration and rehabilitation of the creeks and associated watersheds in the Fort Erie area. 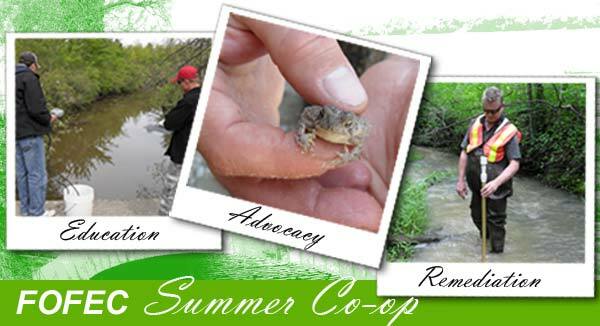 For more than 25 years, the Friends of Fort Erie’s Creeks have supported education and environmental stewardship through our annual co-op program for secondary and post-secondary students. Each year FOFEC provides students with an opportunity to accumulate their mandatory amount of co-op hours through assisting in the completion of our annual objectives. Students will gain an invaluable set of transferrable skills to support academic success and facilitate job readiness. Throughout the summer months students will monitor surface water quality: 1. in the field using a multi-parameter water quality meter, and 2. in our laboratory using a spectrophotometer. Microbiological testing of surface water will be done in our lab as well. Additional activities will include, but are not limited to: flora and fauna identification, stream profiling, benthos biomonitoring, mapping, soil sampling, shoreline cleanup activities, tree planting and report writing. The summer Co-op program consisted of 4, first year students enrolled in the Environmental Technician Field and Lab program at Niagara College. Work was carried out from May 10, until August 25, Monday to Friday, from approx. 8:30 a.m. to 3:30 p.m. The purpose of this report is to provide the Friends of Fort Erie's Creeks and the Fort Erie public with base-line data regarding the status of the creeks, notable species at risk, invasive species, and outline other various works carried out during the term. The Summer Works ProgramGoals and Objectives —	Under the general guidance and direction of the Board, using the YSI Sonde, monitor the 29 test sites along Black, Baker, 6-Mile, Beaver, Frenchman's' and Kraft Drain for temperature, pH, conductivity, TDS, and dissolved oxygen once a week. Multi-parameter surface water testing using a YSI Sonde meter. Sites on Black, Beaver, Baker, Frenchman’s, Miller and 6-Mile Creeks. Collection of water samples from each of the sites. Samples will be tested in the laboratory for nitrates, phosphates and other chemical analyses using a LaMotte Smart Spectrophotometer. Gathering of GPS co-ordinates for each site using a Garmin eTrex Legend unit. Aquatic and terrestrial plant identification at each of the sites. Creek walks of Beaver and Miller Creeks. Benthic macroinvertebrate collection using the OBBN travelling kick and sweep method. BMI sample processing in the laboratory using the Hilsenhoff Index Calculator. Soil analyses of the sites will be done in the laboratory. Greenhouse project will include many native aquatic and terrestrial plants and trees. Seedlings will be potted in the greenhouse, and plantings will occur throughout the summer at several locations.